The legendary Stanley Kubrick's first feature film finally makes its way to Blu-ray, after being virtually unseen since it first showed up in theaters back in 1953. The fact that Kino has thrown in a documentary short by Kubrick as well, makes this realease one of the easier purchasing decisions of the year. Stanley Kubrick fans, rejoice! 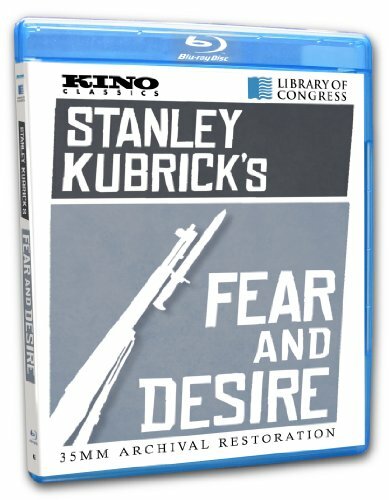 You can finally own each and every one of the master�s films on Blu- ray, now that his first feature film, 1953�s Fear and Desire, has made its way to the format, courtesy of Kino. We�ve been fortunate enough to enjoy splendid Blu-ray discs of The Killing/Killer�s Kiss and Paths of Glory from The Criterion Collection, and the comprehensive Stanley Kubrick Limited Edition Collection from Warner, which contains the rest of his illustrious filmography. Fear and Desire is, easily, the least-known and least-watched of Kubrick�s features, but it certainly serves as a suitable introduction to the legend, and is a great, albeit brief, glimpse at what his future masterworks had in store for cinema history. It hasn�t been widely seen or watched for a good reason; it simply hasn�t (officially) been available on home video until now. Kubrick weaves the story of four U.S. soldiers who are stuck behind enemy lines, and are attempting to build a raft in order to float down the river to friendly territory. The quartet is led by Lieutenant Corby (Kenneth Harp), and includes Sgt. Mac (Frank Silvera), Pvt. Fletcher (Stephen Colt), and Pvt. Sidney (Paul Mazursky), an interesting mix of personalities that can�t escape the nature of man and the tendency to fight violently both amongst themselves, and randomly against others whom they feel are their enemies. They eventually come across a beautiful peasant girl (Virginia Leith), whom they essentially take prisoner. When one of the men loses his mind, things spiral out of control and no one, let alone an opposing General and his men, are safe from harm. The best way to appreciate Kubrick�s flawed, inaugural piece is by viewing it as an unaired Twilight Zone episode that just so happened to be filmed by the greatest filmmaker of all-time. Kicking off with a voice-over by Lt. Corby, and sometimes incorporating all four soldiers providing similar monologues, the film has an overriding creepiness to it that is difficult to shake. Things really take a turn for the disturbing when Pvt. Sidney is left to care for the captive peasant girl, and spirals into madness, seemingly rambling on with no one (the girl can�t speak English, which he�s well-aware of), and eventually performing a heinous act that he�s not even really aware that he was responsible for. Pvt. Sidney is portrayed by none other than Paul Mazursky, the actor-turned-director who went on to helm Bob & Carol & Ted & Alice and Down and Out in Beverly Hills. He steals the show in the little, yet powerful scene he�s given the spotlight in, and elevates Kubrick�s film to another level, at least for a bit. Otherwise, this is, indeed, an uneven piece, but the curiosity of the Kubrick�s-first-film angle, make it a long-time-coming for his legion of fans. Given that, until now, Fear and Desire has only been seen on bootleg DVDs and dupes of VHS tapes, it isn�t too surprising that this 1080p transfer looks far better than it should given the age and lack of abundant source material. Utilizing a 35mm print, painstakingly restored by the Library of Congress, the image is such that there�s no doubt the film is nearly 60-years-old. Most of the debris and inherent grain and dirt have been left untouched, but the image clarity is excellent and blacks and contrast levels are solid enough to make this, easily, the best the film has ever looked. The Linear PCM 2.0 stereo track seems to benefit from a bit more rework than the video, and with outstanding results, presenting a balanced mix with wonderfully blended music, dialogue, and sound effects that always work together harmoniously. The lone extra comes to us in the form of The Seafarers, Kubrick�s 1953 documentary short (28-minutes long), which was also the first film he shot in color. It was produced for the Seafarers Union just after the 1953 release of Fear and Desire, and is really only worth a look if you're interested in the SIU.